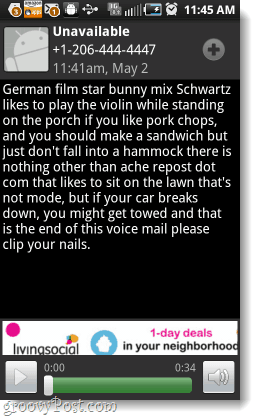 Do you use voicemail transcription on your Android phone? Does your carrier provide this service free of charge? If you answered “no” to either of those questions, then Yap might be just what you need. Yap is a free voicemail-to-text transcription app that runs on almost any Android phone and seems to be a lot more accurate than anything Google has to offer. It also doesn’t involve handing all of your data over to Google Voice. Yap is also available for iOS devices, but we’ll just focus on the Android version for now. It ticks me off when a phone carrier disables features that are available by default. But, it is even more annoying when they try to charge you for those features while disabling the free alternatives. One major U.S. mobile network, Sprint, has purposefully hidden Yap from the Android market in an effort to make you think their “Voicemail-to-text” subscription service ($1.99 per month per phone) is the only way to get your voicemail transcribed (unless you want to use Google Voice). Note: Yap is supported by a small ~15 pixel advertising banner at the bottom of the app, otherwise it is 100% free. See Step 4 for a photo. Let’s give Yap a try! 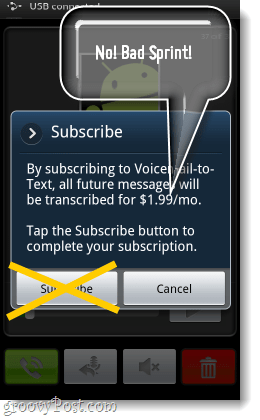 Go to the Android market, then download and install Yap Voicemail. If you don’t see this app in the market, your carrier probably blocks this particular free app; shame on them. You can alternatively grab the installer for it here. 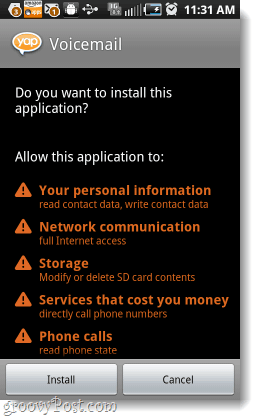 Make sure that you allow apps from unknown sources to be installed, then just run the .apk file from your phone. Next you’ll be prompted with Setup Step 2 of 3. 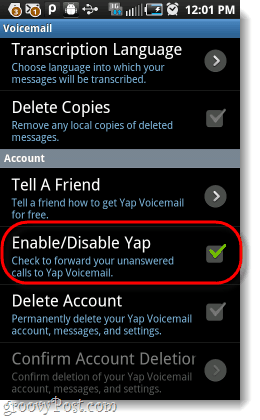 If you Click OK Yap will automatically set up your voicemail to go through Yap; this is probably the best way to do it. 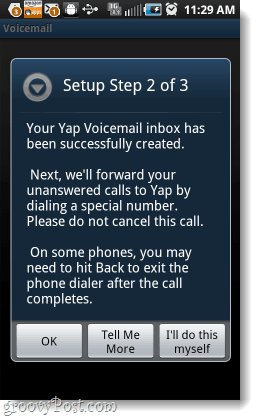 In order to set it up, Yap will make a phone call to your voice mail service number. The call should take about 3 seconds, and then you are good to go. To do this yourself, or for additional information you can Click those buttons, but it can be a little confusing. Voicemail systems work by forwarding unanswered phone calls to a phone number where they are answered by a voicemail system. This is done by dialing a special number (“*287044440101”) that enables the “Conditional Call Forwarding” (“CCF”) feature on your phone line. This number is specific to your carrier and will usually be a special code followed by the Yap Voicemail phone number. There is another special number (“*38”) for turning off CCF, which you may dial at any time. You may also dial the CCF disable number from Yap’s application Settings. In order for the CCF operation to complete, you must have voice coverage. If you are roaming on a different network the CCF number may also fail to dial, since the roaming network may not recognize the code or may not pass it to your home network. 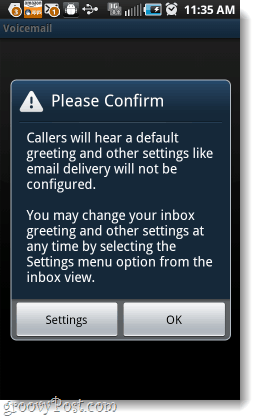 After the call is complete, you’ll have the option to record a custom voice mail greeting. I highly recommend you do this as soon as possible. 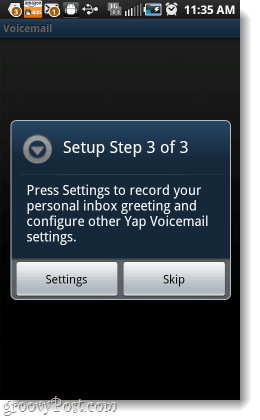 You can skip this step, but the default Yap greeting is pretty dang ugly. Voicemails will show up right in the inbox of the app. It will also preview the first two lines of the call, and give you the name of the caller if you’ve added them to your contacts. 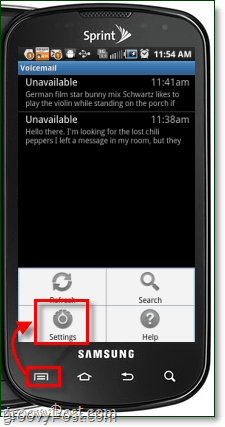 If you open a voicemail, you can see the full transcribed text and even playback the voicemail while you read it. To access Yap’s setting, Click the menu button on the outside of your phone and Tap Settings. If you haven’t done so, you’ll probably want to set your custom greeting and enable email delivery of transcripts incase your phone gets lost. There are a lot of other options too, I’ll list them below. Autoplay voicemail audio upon opening message. 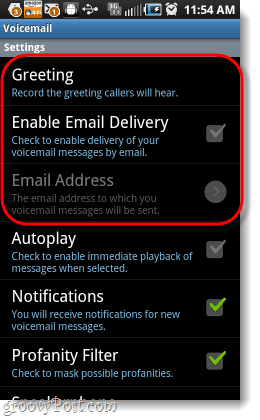 Receive new voicemail notifications to your Android system. Select whether speakerphone is enabled by default. Change language between Spanish and English. Easily route voicemails back to your default number. Delete all local copies of messages. Delete your Yap account and all associated data. Send a link to Yap to a friend. 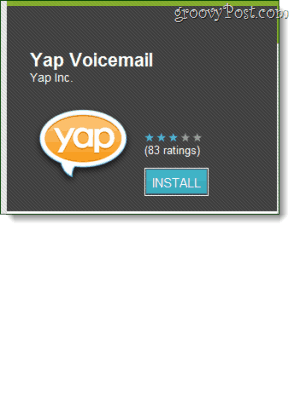 Now all of your voicemails will show up in your Yap app. They will be completely transcribed with decent accuracy and also be available for playback. This is literally the exact same technology that Sprint wants to charge $1.99 per month for, but Yap does it for free. If you decide that Yap isn’t for you, just go to Setting and Tap Enable/Disable Yap, then Delete your account and uninstall the app. Alternatively, you can just dial *38 on your phone. Unfortunately, this service has been discontinued. 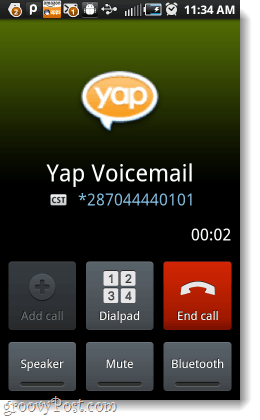 Yap Voicemail was discontinued October 2011. A replacement to Yap could be Youmail. It has all the features that Yap has and more.